Five years ago, Puzzle Pieces opened its doors to the public for the very first time. Today, it boasts two sites, 127 active clients, and a brand-new Community Mentor Program that connects elementary school students to Puzzle Pieces clients. 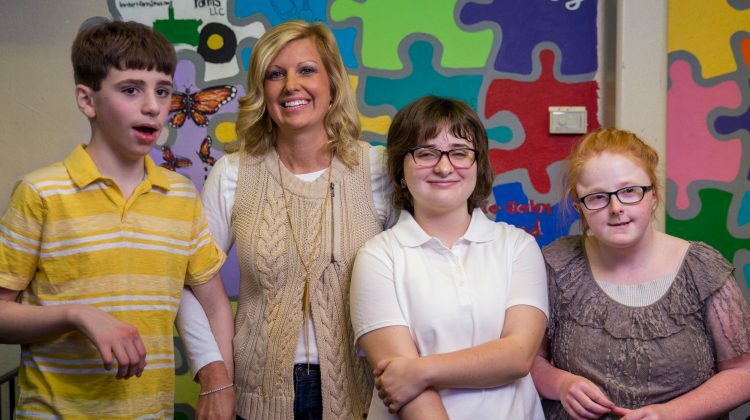 Executive Director Amanda Owen’s passion is evident from her tireless work and initiative to connect her team and the community to individuals with intellectual disabilities. Amanda started out as a special education teacher who sought to fill a need in creating a social environment for those with intellectual disabilities by providing a safe place for them to hang out and learn valuable skills. While she was teaching at Burns Middle School, Amanda helped create a peer tutoring program that connected middle school students to those with intellectual disabilities, which resulted in increased understanding, open-mindedness, and even lifelong friendships. The success of those relationships led Amanda to continue the peer tutoring idea in a different setting. Beginning this fall at Tamarack Elementary, Puzzle Pieces is launching the Community Mentor Program for students in third grade and above. With the help of Tamarack Elementary School guidance counselor Jamie Tipmore and principal Carrie Munsey, 20 students from Tamarack have applied and will be paired up with a peer at Puzzle Pieces. After striving for at least five good candidates for this pilot program, Amanda is thrilled with the excitement from Tamarack. “We want to reach out to other individuals who don’t have disabilities to access our programming alongside their peer with a disability,” she said of the program. Student mentors will be receiving pre-surveys, mini-training sessions, and an educational course to help build relationships with their peers at Puzzle Pieces. The hope is that these relationships extend past the school year and become lasting friendships. So, what will this new program look like? One to two days a week, each Tamarack student will spend a few hours after school with a peer and a staff member at Puzzle Pieces, to help interact and build a relationship. Amanda is excited about launching the Community Mentor program, but transportation remains an obstacle. As of right now, transportation from Tamarack to Puzzle Pieces is up to the parent or guardian, but Amanda hopes that potential grant money or future donations can help alleviate this problem with the eventual purchase of a van.